In many parts of the world, poor air quality has shaped up as a major health hazard. While air quality is traditionally seen as the source of respiratory ailments, there is mounting evidence that low air quality has far reaching impacts upon human health. As an example, it exacerbates the deteriorative illnesses of old age. Air quality is hyperlocal; it varies quite a bit by small changes in location. A person may choose which room or which floor in a building is better based on the information. Physical exercise should be avoided when air quality is worse than certain thresholds. The decision to use a mask or not. The decision to buy or switch on an air purifier. Testing the correct working of an air purifier by examining the air quality at inlet versus exhaust. 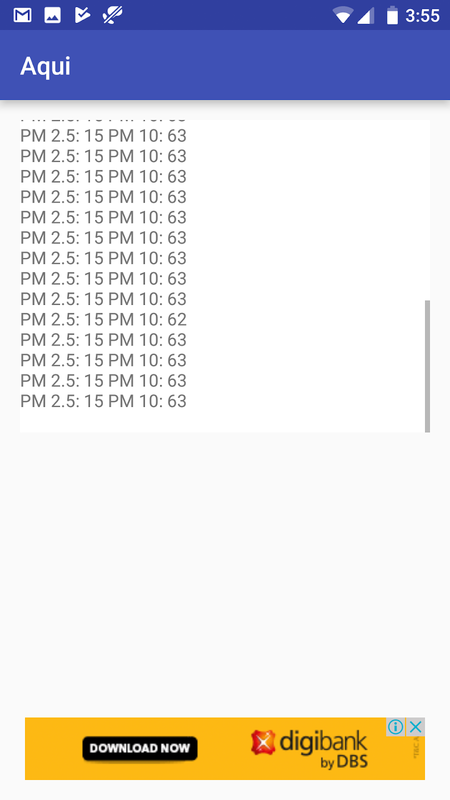 To do these things, we need an inexpensive, convenient, portable air quality meter. While there are many dimensions to clean air, for the present purpose, we will focus on solid particulate matter with particle size below 2.5 microns ("pm2.5"). 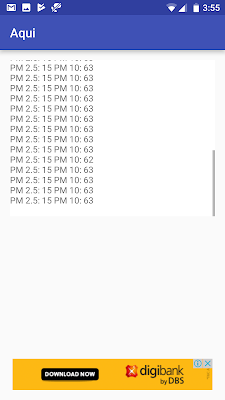 Shows and logs PM2.5 readings. Only two button, power and menu. This makes the Laser Egg easy to operate. Connects to wifi and uploads data on a server. Costs approximately USD 130. Too expensive for countries with air quality issues. It is 288 grams, and not small enough to be carried in a pocket. It has to be regulary charged. Everyone walks around carrying a mobile phone, which contains a battery, a CPU, a display, a GPS, and a connection to the Internet. This makes it possible to sharply reduce the cost and complexity of measuring air quality. All that we'd need is a sensor that reads the air quality, and gives this information to the phone. Everything else can be done on the phone. I chose a sensor, the SDS021, which costs roughly $20. I wrote the software which runs on an Android phone and takes in data from this sensor and displays it. It costs about $20, which is significantly cheaper. It is much lighter and smaller. It fits in a pocket. Doesn't have to be charged regularly since it takes power from a phone. The data is processed in a phone. Other sensors in the phone such as GPS can be collaborated. Buy this sensor, e.g. from Aliexpress. Buy an adapter to connect into micro USB or USB C , depending on what your phone requires. Run the program, plug in the sensor. Ayush Patnaik is student of Physics and Mathematics at Australian National University.